WTI prices are on the bid this morning trading above the 58 level as the energy benchmark benefited from the US inventory reports and comments from global oil producers’ favoring further supply cuts. However, uncertainties surrounding the US-China trade deal and doubts over the global economic growth continue to challenge bulls. On Friday, the International Energy Agency came out with its February month output report that mentioned OPEC’s production declining to a four-year low. Also adding to the energy strength were upbeat comments from the global oil producers like Saudi Arabia and Russia. Both the leaders of the OPEC+ alliance kept on favoring further production cuts in order to balance the global energy market. WTI prices are still capped between the $58 and $58.9 levels as they retreated from the overbought zone. 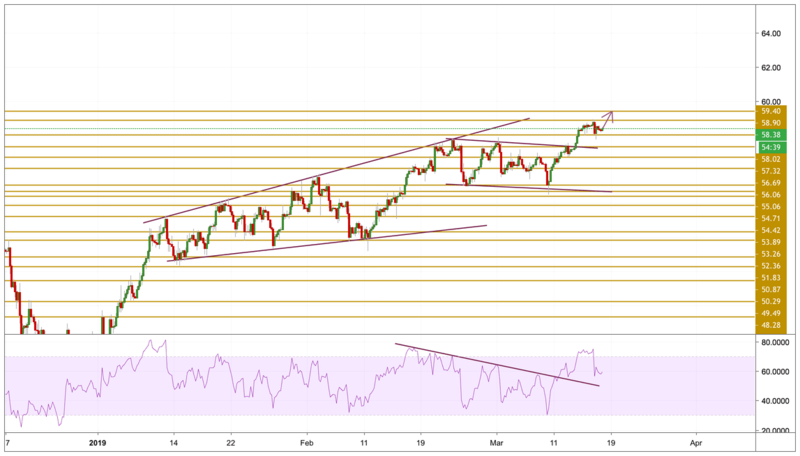 The price is currently trading just below the $58.4 level and looks set to continue surging towards the $60 level after breaking above the channel last week. If the right momentum will be picked up again, we will be focusing mainly on the $59.4 resistance level.